Welcome to Ward 5 Online: MLK Day Events! 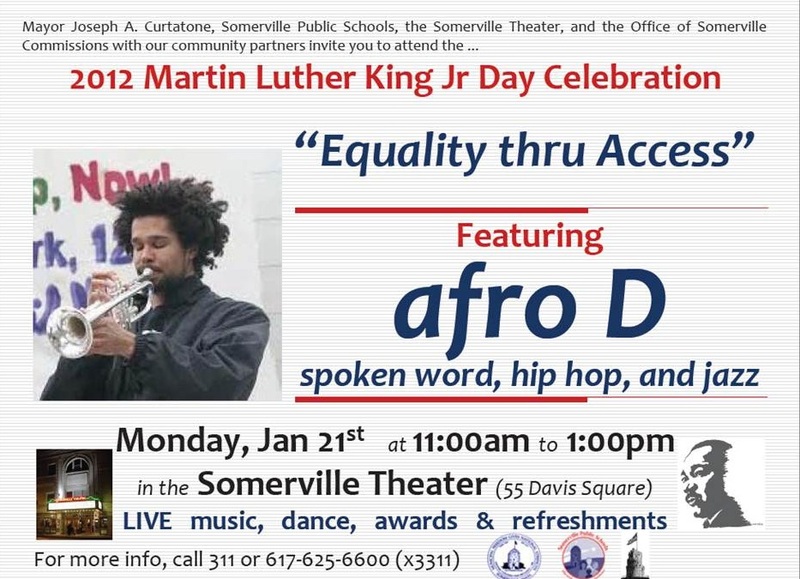 SOMERVILLE - Mayor Joseph A. Curtatone, the Somerville Office of Commissions and the Somerville Public Schools announce the annual Martin Luther King, Jr. Celebration event, entitled, "Equality Through Access," to be held on Monday, January 21st in accordance with national MLK Day remembrance. 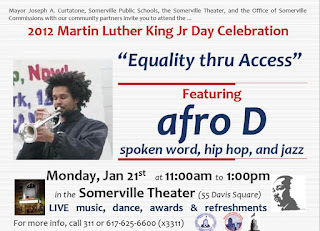 The 2013 event will be held at the Somerville Theatre from 11am - 1pm, and will include a keynote speech by Lorraine Cordeiro, Assistant Professor and Family Research Scholar at UMass/Amherst as well as live music, readings from Somerville student essays in response to the 2013 theme "Equality Through Access," and an award presentation to community members who exemplify MLK's legacy in the Somerville community. The event is free and open to the public. 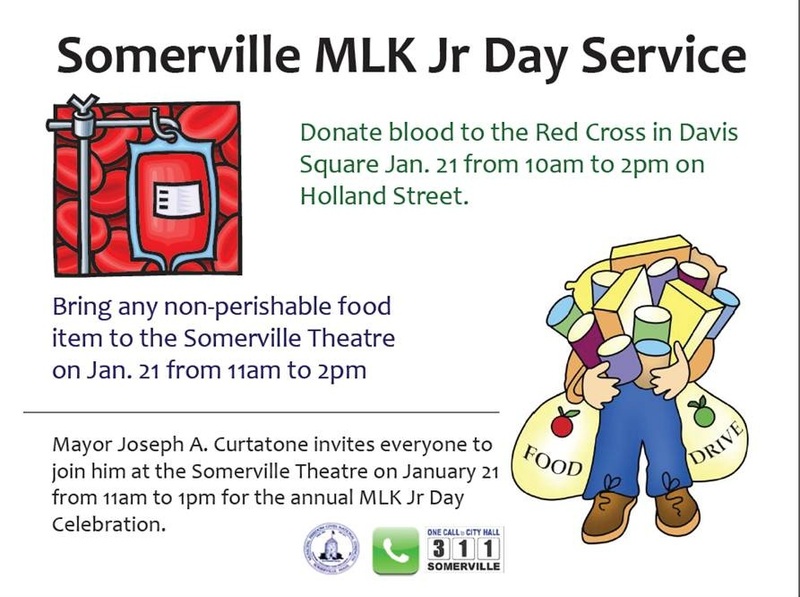 Additionally this year, the City of Somerville and MLK Jr. Day Committee are sponsoring a "Day of Service," which will include a Red Cross Blood Drive and canned food drive. 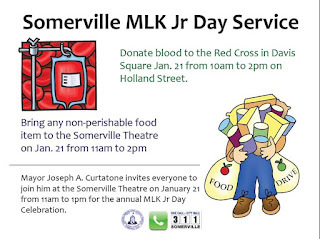 The American Red Cross mobile unit will be stationed outside of the Somerville Theatre from 11:00am to 4:00pm. To make an appointment, please call 1-800-733-RED-CROSS, or visit redcrossblood.org. Donations of canned and non-perishable food will be accepted at the event, to support local food pantries. 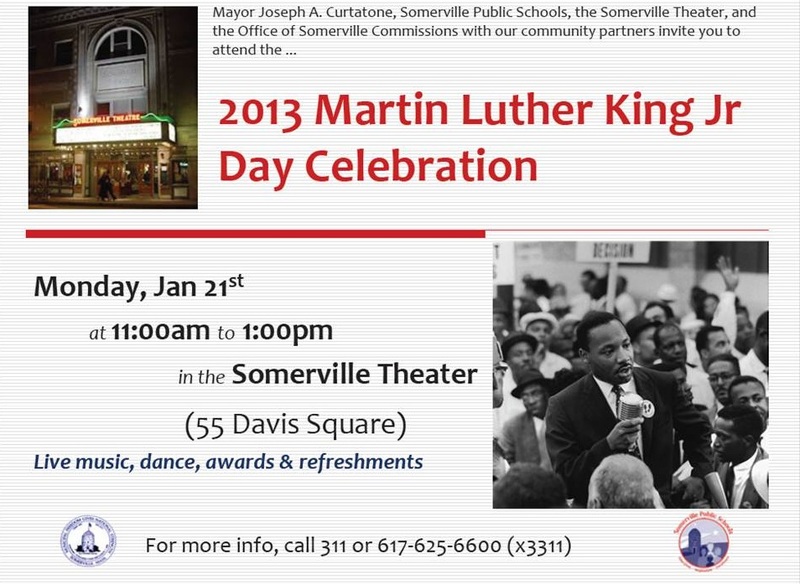 "As we take the opportunity to mark this year's annual commemoration of Reverend Dr. Martin Luther King Jr. and the Civil Rights achievements, we honor our own Somerville individuals who keep his dream alive," said Mayor Curtatone. "Our celebration is meant to keep the work of today's children and adults in our hearts and mind all year long as we remember Dr. King's legacy." The day's events will include live performances by AfroD, youth from the Elizabeth Peabody House, and the Somerville High School Dance Group. Refreshments will be served. The 2013 keynote speaker, Lorraine Cordeiro, is an Assistant Professor and Family Research Scholar at UMass Amherst, whose research focuses on food security and the connections between high risk behaviors and hunger. This year's performer, AfroD, performs through spoken word, instruments, and music that combines hip hop, jazz, and more. He also considers himself an advocate for social change, presenting about issues of social justice and making good choices to young residents around the region. Clennon King, Director of Marketing and Development at the Elizabeth Peabody House and former journalist, will present a reading of Dr. King's speech. Clennon King is a Southerner and Native of Albany Georgia where his father was a lawyer for Dr. King (no relation). Clennon was a TV news reporter for NBC Dallas, ABC Atlanta, Fox Miami, NBC Mobile, and NBC/ABC Jacksonville before coming to be a resident of Somerville and working for Elizabeth Peabody House. The event is organized in cooperation with the City of Somerville Health Department, Somerville Public Schools, Human Rights Commission, Community Action Agency of Somerville, The Welcome Project, Somerville Commission for Women, Fair Housing Commission, Commission for People with Disabilities, and Elizabeth Peabody House. Special thanks to the Somerville Public Schools, Cambridge Portuguese Credit Union, and the Somerville Theatre for their support and sponsorship of the 2013 event. For more information, please contact Director of the Office of Somerville Commissions Sonja Darai at 617-625-6600 ext 2406, or SDarai@somervillema.gov.